Summary: Who is the real author of The Black Insignia? Is it H. R. Sanders, whose name is printed on the cover of every installment of the wildly successful young adult adventure series? Or is it Daniel Roche, the enigmatic world traveler who disappears for months at a time? When Daniel’s great-niece, Hélène, moves to Paris to study archeology, she does not expect to be searching for answers to these questions. As rumors circulate, however, that the twenty-fourth volume of The Black Insignia series will be the last, Hélène and her friend Guillaume, a devoted fan of her great-uncle’s books, set out to discover more about the man whose life eludes her. In so doing, she uncovers an explosive secret dating back to the darkest days of the Occupation. THE TRAVELS OF DANIEL ASCHER by Deborah Levy-Bertherat, translated from the French by Adriana Hunter, is really unlike any book I've ever read. I've seen comparison to a SARAH'S KEY/THE BOOK THIEF mashup; however, this little novel is special in its own way. 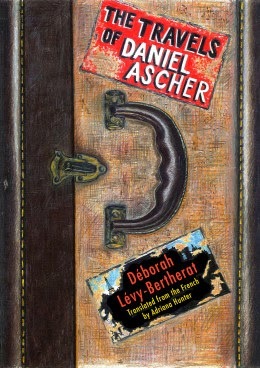 THE TRAVELS OF DANIEL ASCHER really is a short novel, about 180 pages, that explores stories, storytelling, secrets, and the truth. However, it's also a touching story about one man whose life was forever changed as a result of the Holocaust. That might sound like a lot for a little book, but Ms. Levy-Bertharat accomplishes that and much more. Helene is a young woman who moves to Paris to continue her studies in archeology. She stays in her great-uncle's apartment because he is away traveling much of time. Her uncle is Daniel Roche, an author who writes the popular Black Insignia series under the pen name H.R. Sanders. Helene was never that interested in her uncle or the books he writes; however, when she starts dating a fellow student named Guillaume, a huge fan of the series, she begins reading the novels... and becoming more interested in learning about her strange and eccentric uncle. All Helene knew about her great uncle was that he was a Jewish boy adopted by her family during World War II. His name was Daniel Ascher but most of his life is a secret. As Helene delves into understanding her uncle and his past, she discovers more questions than answers. THE TRAVELS OF DANIEL ASCHER packs a powerful punch. It's part historical fiction in that it takes the reader back to the Nazi occupation and part mystery because Helene is searching for clues about her great-uncle, but it's also a bit of an adventure story. Daniel was a very unique individual for many reasons, and he incorporated some aspects of his life in his stories and books. I loved how everything eventually came together to make an interesting read. Despite being such a compact book, THE TRAVELS OF DANIEL ASCHER does make readers think... and that's why I enjoyed it so much. I've read quite a few book that take place during World War II and explore the Holocaust, but this one was different. The author used both the character of Daniel and his creative storytelling to tell this story. The novel provides quite a bit food for thought on many important themes including memories, secrets, identity, and the power of stories. One thing I appreciated about THE TRAVELS OF DANIEL ASCHER is that it was a book for both adults and teens. I actually think it's a wonderful book for teens, and I would love it if my daughter had to read it for English or History class! There is an in-depth teaching guide that would help instructors present the important themes from this novel to their students. Overall, THE TRAVELS OF DANIEL ASCHER is a wonderful book. It's a mix of history, adventure, and mystery that's sure to entertain both adult and teen readers. Highly recommended. You've sold me - this sounds wonderful!